Indian rojak platter with red dipping sauce, originally uploaded by Camemberu. 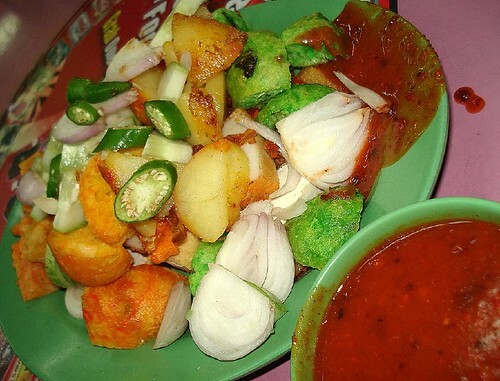 Indian rojak - fritters of various kinds topped with chopped onions, cucumber and green chillies. This is from a small humble corner stall in a narrow coffee shop at Jago Close (near East Coast Road). Their fried potato is nicely seasoned, unlike the bland types elsewhere. There is a certain fruity or fragrant sweetness to the dipping sauce - perhaps pineapple? I can't tell. I'm just thankful it isn't dominated by sweet potato mash, like it is at Saji's and Geylang Serai's. But other than that, this is quite an ordinary but satisfying Indian rojak. 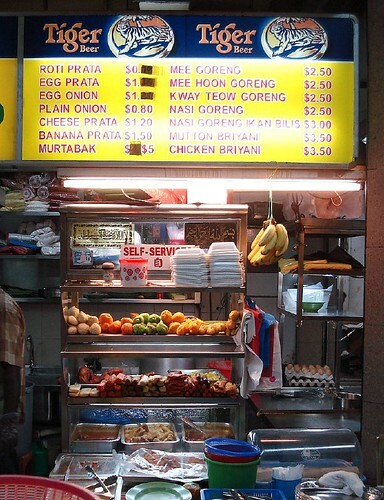 Indian Rojak stall, which also offers other goodies, originally uploaded by Camemberu. I have only ever tried Indian rojak from this stall. Next time I should try some of its other stuff like prata, mee goreng or briyani. I agree that the sweet potato mash can be overwhelming at times...I like my dippping with crushed peanuts! Nic, me too!!!! I think I must BYO next time...so few places do the sauce right. Yong Hup delivers local snacks! Alton Brown and Good Eats! New diet drinks in Cold Storage! It's Dars - Dars it?